This was an organizing workshop with the leadership of March For Our Lives, the organization that emerged from the horrible shooting at Marjorie Stoneman Douglas High School in Parkland, Florida in February 2018. 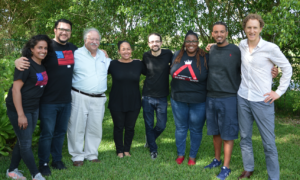 The aim of the workshop was to develop new organizing capacity among the core leadership both in Parkland and across the country in the movement to end gun violence. The young people who attended the training included 10 leaders from Parkland and 10 from around the country, including regional leads who are supporting the development of chapters where young folks can get involved in efforts at the local level. The workshop was held in Parkland, Florida. We did a 2.5 day workshop on the 5 leadership practices of organizing with coaching as a through thread to support the development of the others. Additionally, the 4 teams that went through the training each develop some “sandbox” ideas for campaigns for specific regions in the country. For the training team, the workshop was a reminder of how much trust, skill, and capacity can get developed in this setting. One thing that really stood out was the value of defining leadership as being as much about questions as about answers. There was so much pressure to have the answers that the participants had felt in the past year (as well as in their school work) that having a space to ask questions, to not have all the answers was a big relief for many. We were also reminded that a movement has to balance the tension of mass involvement with the discipline of skilled individual and group interactions in a structure that lets folks know where and how to contribute. The big question that we are grappling with is how to support the application of all the learning that happens in the workshop. We do a great job of creating the emotional and structural support for folks to go to deep, real, and meaningful places both in terms of heart and head work. But the application of these learnings, as we all know, is not easy. How do we set things up to provide support to the on going work?